WACO – In a game that came down to the final seconds, the McLennan Highlassies fell to the Blinn Buccaneers 71-69 Monday night at The Highlands. The teams kept it close through the first 13 minutes of play. McLennan built a 10-point lead, 24-14 with 7:03 remaining in the first half and held the 40-30 advantage at the break. Blinn came out shooting in the second half, using a 13-3 run to tie the game at 43 with 14:36 to play. The teams traded the lead for the next seven minutes. The Buccaneers began to pull away down the stretch, taking the 62-56 lead with 3:54 remaining in the game. Blinn led 71-65 with 27.46 seconds on the clock. A jumper and two free throws by Caylinne Martin pulled the Highlassies within two, 71-69, with 15.75 to go. McLennan regained possession on a jump ball with just over 6 seconds to play and had a chance to steal the win with a 3-pointer at the buzzer but it came up short. Martin led the Highlassies with 22 points. Re’Elle Miller and Tayla Taylor added 12 and 10, respectively. 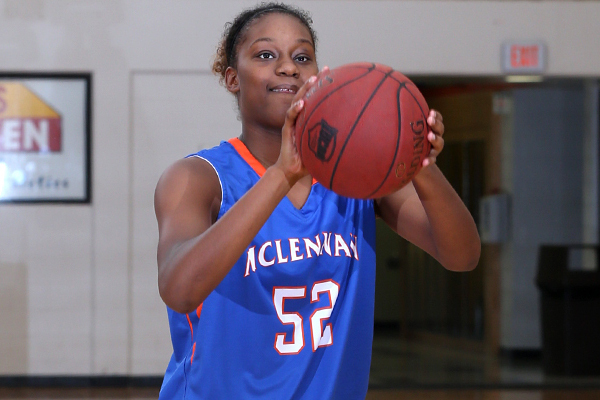 McLennan will face Southern-Shreveport at 8 p.m. on Jan. 3 in the McLennan Shoot-out. Blinn: Brianna Luton 1 2-2 5; Katelynn Johnson 6 4-4 19; Shakera Barnes 3 4-4 10; Ashley Cherry 3 2-2 8; Micarah Malone 2 0-0 4; Chant Lewis 3 9-13 15; Moe Bedford 1 0-0 2; Nancy Warioba 1 0–0 2; Penina Faumui 2 2-2 6; Totals: 22 23-27 71. McLennan: Kaylin Roher 2 0-0 5; Kendra Wynn 1 1-2 3; Demi Cumby 1 0-0 3; Re’Elle Miller 3 6-8 12; Diamond Ervin 1 2-2 4; Amani Davis 2 0-1 6; Tayla Taylor 4 1-2 10; Adrienne Drake 1 2-2 4; Caylinne Martin 8 6-9 22; Totals: 21 19-26 69. 3-pointers: Blinn 4 (Johnson 3, Luton 1), McLennan 6 (Roher 2, Davis 2, Cumby 1, Taylor 1); Total fouls: McLennan 21, Blinn 26; Fouled out: Blinn (Cherry, Warioba), McLennan (Miller); Halftime score: McLennan 40, Blinn 30; Record: McLennan 4-7.